Unlimited Domain, Sub Domains, FTP Accounts, File Manager. Fantastico: Blogs, CMS, E-Commerce and other scripts. Web Statistics, Web Based File Manager, Customer Error Pages. 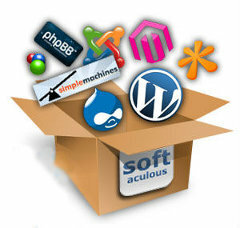 We are using cPanel for many years and can say without doubt it is the best web hosting control panel available today. Your can contstantly review your websites performance through a set of powerful reporting tools, Awstats, Latest Visitors, Error Logs and more ..
All of our web hosting plans now include more than 50 Powerful scripts all installed at the click of a button with Softaculous! Shopping Carts, Forums, Blogs, Customer Relationship Tools, FAQ Systems, Site Builders, Form Generators, Support Ticket Systems, Photo Galleries, Classified Systems, Banner Servers and more! - Everything you need to power your website! Password Protect your directories, block unwanted visitors with the ’IP Deny Manager’ and a number of other features to secure your files and bandwidth. As well as Fantastico scripts there are a number of other handy CGI/Perl modules that you can use in your website, such as GuestBook, Counter, Clock and Search.